On May 12th, 1958 ten farmers from Craven County joined together to form the Craven County Farm Bureau Federation. 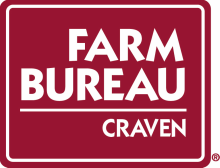 With humble beginnings, the Craven County Farm Bureau grew and as of date our membership has grown to 7000 Farm Bureau Families. ​Today the majority of our membership does not farm as they once did but we are still striving to promote Agriculture in our state and county. The Craven County Farm Bureau Board of Directors in conjunction with the Women's Committee and the Young Farmers & Rancher’s Committee have worked together to ensure that Farm Bureaus name is recognized in our communities by contributing to FFA, 4 - H, Ag In The Classroom, Coastal Envirothon, Coastal Plains Livestock Show, Tobacco Farm Life Museum, R. Flake Shaw Scholarship, and Going Local NC Grant along with other worthwhile causes.